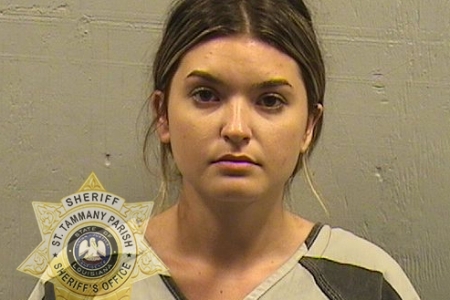 The St. Tammany Parish Sheriff’s Office has arrested another individual in connection with the deadly incident that occurred Saturday evening along the West Pearl River. Detectives have also increased the charges against an individual previously arrested. Blaine Manalle (DOB 3/16/1998) of Slidell, was arrested Monday evening for one count of LRS 14:30.1 Second-degree Murder. She was booked into the St. Tammany Parish Jail. Shortly after 5:30 p.m. Saturday (June 9), St. Tammany Parish Sheriff’s deputies were dispatched to an incident that occurred on a sand bar along the West Pearl River just south of the Davis Landing Boat Launch. When deputies arrived they learned there had been a disturbance at the location between two large groups of individuals, which resulted in a physical altercation. Jeffery Howell, 46, of Pearl River, died as a result of injuries he sustained in that altercation. Sunday morning (June 10), the St. Tammany Parish Sheriff’s Office arrested two Slidell men in connection with the incident. Cameron Alphonso (DOB 3/9/1997) of Slidell, was arrested on one count of LRS 14:31 Manslaughter (Felony) and booked into the St. Tammany Parish Jail. Alden Kindergran (DOB 7/10/1995) of Slidell, was arrested for one count of LRS 14:103 Disturbing the Peace. He was booked into the St. Tammany Parish Jail and was released Sunday afternoon on a $750 bond. The St. Tammany Parish Coroner’s Office conducted an autopsy Monday morning, ruling the death a homicide and listing the cause of death as blunt force trauma to the head. Monday (June 11), after obtaining additional witness statements and reviewing the results of that autopsy, the charge against Alphonso was upgraded to LRS 14:30.1 Second-degree Murder. STPSO detectives are continuing to conduct interviews and collect facts and information that may potentially lead to additional arrests. This is a very active and open investigation and no additional information will be provided at this time. “I applaud the hard work, dedication and exhaustive efforts of our detectives who have worked long hours and interviewed in excess of 40 people in an effort to establish the probable cause necessary to make an additional arrest in connection with what took place Saturday evening,” Sheriff Randy Smith said.